I am a huge fan of sweatshirts! I would live in just a sweatshirt and jeans or yoga pants if I wasn’t so into sewing clothes and fashion! This Fall/Winter I really wanted to make a comfy cozy sweatshirt that didn’t really look like a sweatshirt. With so much inspiration on Instagram and some incredible knits to choose from in the shop I set to work styling and creating the perfect “secret pajama” top. 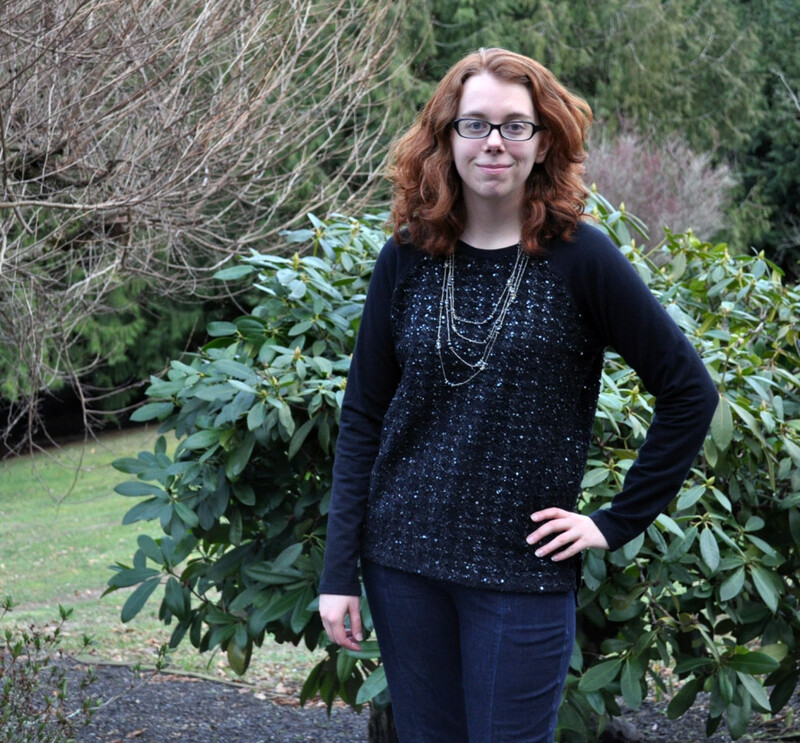 For my pattern I selected the Linden sweatshirt from Grainline Studios. 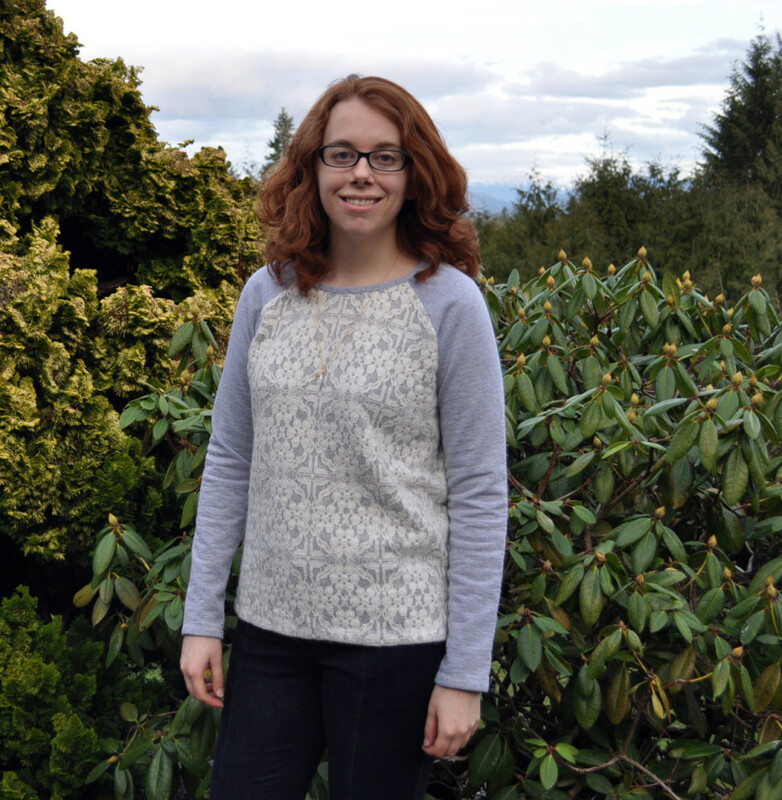 I haven’t been disappointed yet by one of Jen’s patterns and this one was no exception! 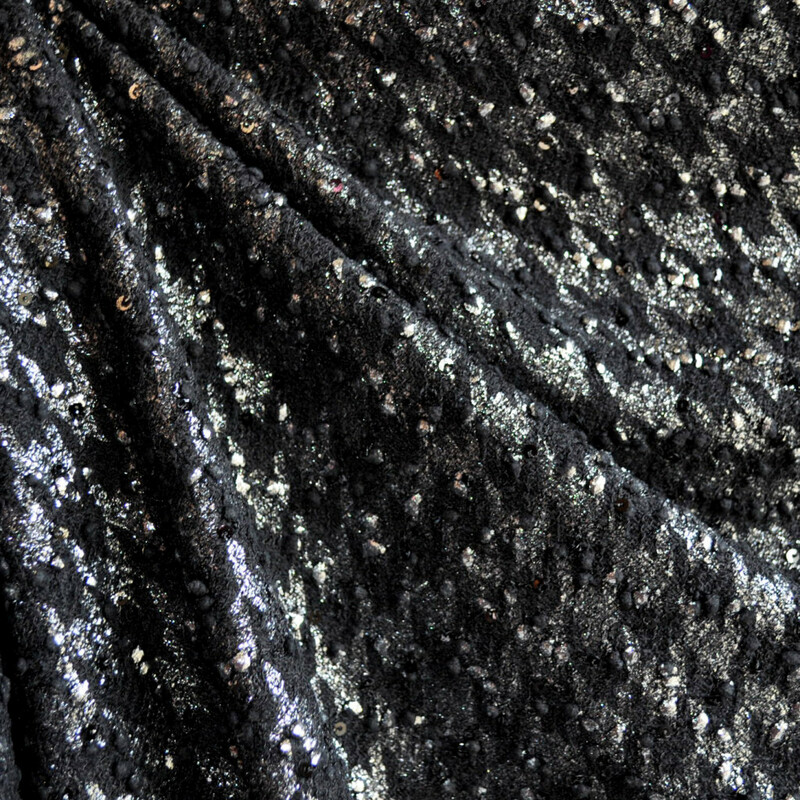 For fabric, inspiration struck in the form of a sluby black sweater knit with printed silver metallic houndstooth print. Strange combination I know… but subtly striking and perfect for an elevated Linden. 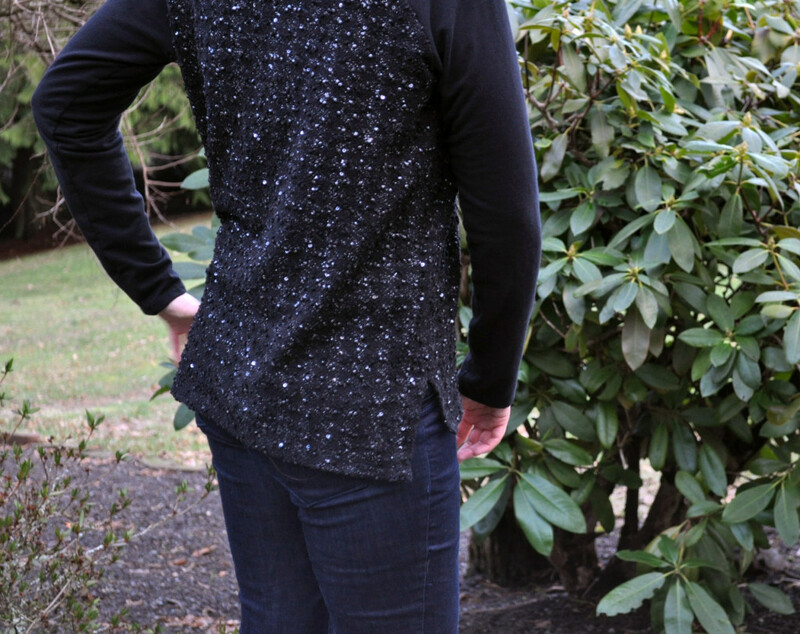 I’m not an all out flashy person so I paired the metallic sweater knit with a super soft black sweatshirt fleece for the sleeves and neckline. A yard of each and I was ready to sew! Drawing inspiration from Lauren at Baste & Gather, I decided to loose the band at the hem and sleeves and create a slit at the side seam. Using the helpful lengthening lines on each of the pattern pieces I lengthened the front by 4-1/2″, the back by 7″ and the sleeves by 3″. This would make up for the missing hem bands and give me enough length to create a 4″ off-set slit that hits right at the hip. With the help of a tutorial Kelli of True Bias posted on the Sew Mama Sew site I sewed up my Linden and created two perfect side slits. I finished it off by hemming the sleeves and hemline with my overlock machine for a very professional look. I have to say I am very happy with the results and it is so comfortable to wear! Dress it up or down for just about any occasion. 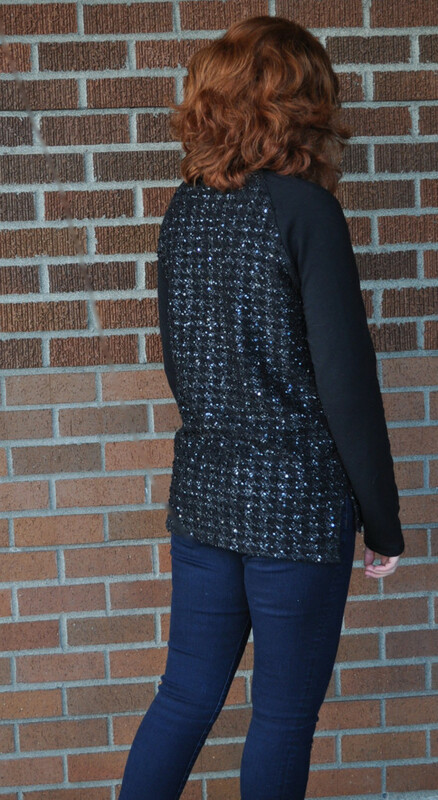 Truth be told, I loved the results so much I immediately sewed up another version using an amazing lace overlaid sweater knit pared with a grey sweatshirt fleece. A yard of each, a quick sew and I had another Linden to add to my wardrobe rotation! So quick and easy, I love this Grainline Studio pattern and will definitely be making more variations in the future! 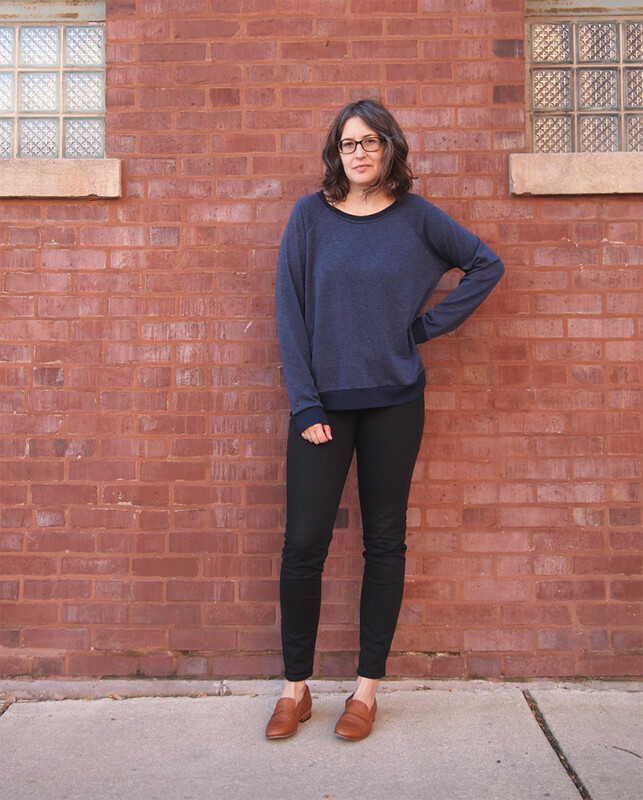 I think for spring I will try a lighter weight sweatshirt fleece and make a basic solid Linden in a fun Spring color. Maybe this beautiful rose… Perfect for my wardrobe basics I am on a mission to sew. P.S. One last picture… I love how the houndstooth metallic shows up in this one!